…and let us do the binding. Printing is usually the most expensive component of your Yearbook. But your institution probably already has a Yearbook-Quality printer. Most late model Color Copier/Printers with speeds of 40 pages per minute or higher are good enough to print your Yearbook. So, don’t waste the high-end Color Copier/Printer in your school or school district. 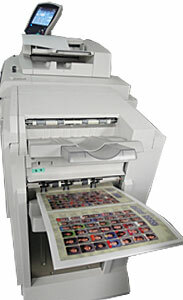 Use it for printing your Yearbook and ship your prints to us for Hard Cover Binding only. You will save your school and your students up to 80% of the cost of publishing your Yearbook! When you send us your prints, you leave the trimming stitching and cover-making to us. Yes, we do everything except print the pages. What you get back is your completed Yearbooks, bound with the Hard Cover Design of your choice, but at a price that could be up to 80% less than usual! 1. Confirm that you can print from a computer to your school’s color copier/printer. To get the highest quality out of your copier/printer, you have to print directly from your Yearbook file. Quality is greatly reduced when you make copies from paper originals. So it is essential that you can print directly to your color copier/printer from a computer file. 2. Confirm that your copier/printer can print on coated paper. 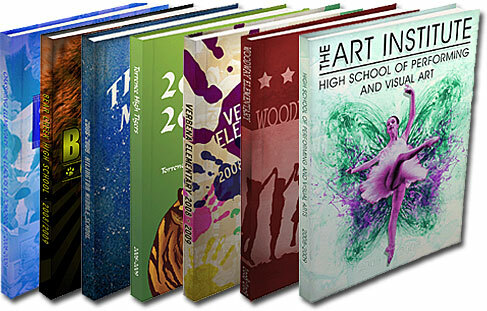 Color images print the best on coated paper, and that’s why Yearbooks and photo books are usually printed on coated paper. Coated paper comes in either Gloss finish or Matt finish. Contact the color copier/printer provider for your school to find out if your equipment can print on coated paper. You can also ask the service technician who comes by to repair the machine. If the answer is Yes, then you’re almost there. 3. Find out the largest sheet of coated paper your color copier/printer can print. If the maximum sheet size is 11×17 inches or less, then you can print only 1 full-bleed* page on the front of a sheet and another on the back. If your copier/printer can print on coated paper that measures 12×18 inches, then you can print two full-bleed* 8.5x11inch pages on one side of a sheet and 2 pages on the back. This automatically cut’s your printing cost in half. If your copier/printer prints coated paper up to 13x19inches in size, then you can print up to 2 full-bleed* pages that measure 9×12 inches on the front of the sheet and 2 more on the back. 4. Confirm the best settings for printing your Yearbook file. To do this, print a few pages from your previous Yearbook file on the coated paper of your choice and compare the print quality with your old already printed Yearbook. For late model color copier/printers, the default setting is usually good enough. But if the quality is not satisfactory, contact your school’s color copier/printer provider or the technician who fixes the machine for instructions on how to get the quality you want. 5. Request your DIY Yearbook Contract. Once you’ve determined that you’re capable of printing your Yearbook file on your school’s copier/printer, it’s time to draw up a DIY Yearbook Contract. The Contract outlines our time and quality obligations and covers all applicable details, including prices and delivery dates. The Contract also enables you to pay in 30 days after delivery, instead of up-front. * You can use SuruDesigner, our Free Yearbook Software, to design your DIY Yearbook. * Whether or not you use SuruDesigner to prepare your DIY Yearbook, we can help you to optimize the file to print on your school’s copier/printer. For instance, if your copier/printer can print on 12×18 inch coated paper or larger, we will configure your file to print 2 pages on either side of 1 sheet. That way, you get to bypass any complex settings for your copier/printer. We are happy to do this free of charge. We will then send your configured file back to you–ready to print. Sending the file back and forth is done through Hightail, the online file transfer service to which we subscribe. Again, there is no charge to you for using this service.